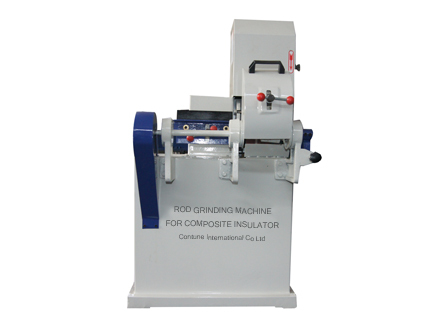 WHY SHOULD USE THIS “INSULATOR ROD GRINDING/SANDING MACHINE”? Since we now know that rod grinding process is necessary during insulator production, why would we choose to use this grinding equipment instead of just grind the rod manually? This rod grinding equipment has much higher efficiency in mass insulator production. It is powered by electrical motor and grinds the fiber glass rod rapidly with constant speed and force, which ensure that all the rod will be sanded as same. The limit of tolerance will be controlled in a very small range which is regarded as effective control of quality. This rod grinding equipment is available for several types of composite insulators: long rod insulator (known as suspension insulator, tension insulator, dead-end insulator), pin type insulator and several post type insulators. The diameter of the rod can vary in a large range. Besides, this “FRP rod sanding machine” manufactured by us Contune International Co ltd is improved and optimized in structure and functions according to problems raised by insulator manufacturers during the production, in order to ensure that the rod grinder can be easily installed and operated. Easy maintenance is also its pros. Video of “How it really works” on fiber glass rod of composite insulator ? How is after-sales of this “fiber glass rod grinding machine for polymeric insulator”? We provide free online technical support for all machines and equipment supplied by us via e-mails, chatting tools and telephones.